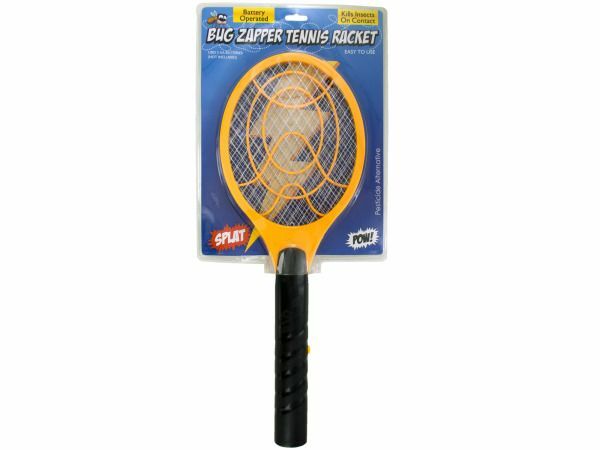 Kill insects on contact with this Battery-Operated Bug Zapper Tennis Racket, a pesticide alternative that kills flies, mosquitoes, spiders and more. Simply push the button on the handle to activate an electric circuit to kill insects when they come into contact with the wire mesh of the racket. Uses 2 AA batteries (not included). For adult use only. Comes packaged in a hanging clam shell. Package measures approximately 20 x 8.75 x 1.5.